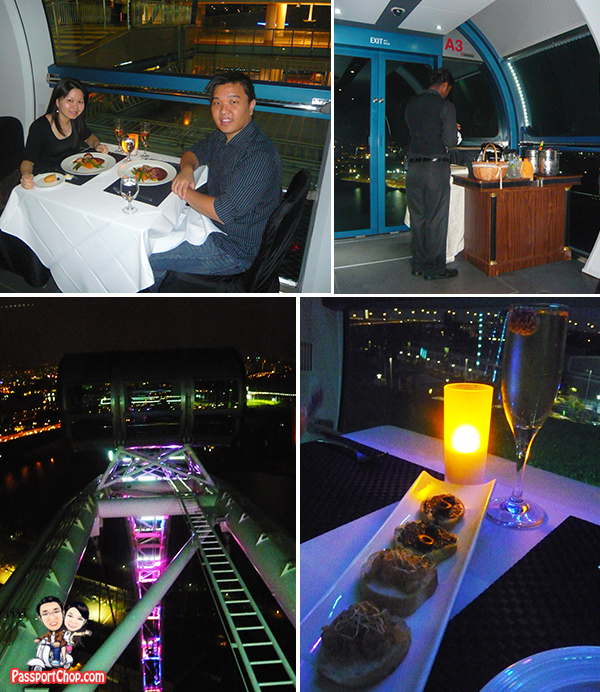 For a dinner with a view of Singapore’s skyline, no restaurants can beat the Singapore Flyer Sky Dining experience. We had tried the Sky Dining at the Singapore Cable Car and it was quite an interesting experience as the cabins were much smaller and there isn’t a lot of space to move about and standing was definitely not encouraged if you want the Cable Car to be stable. 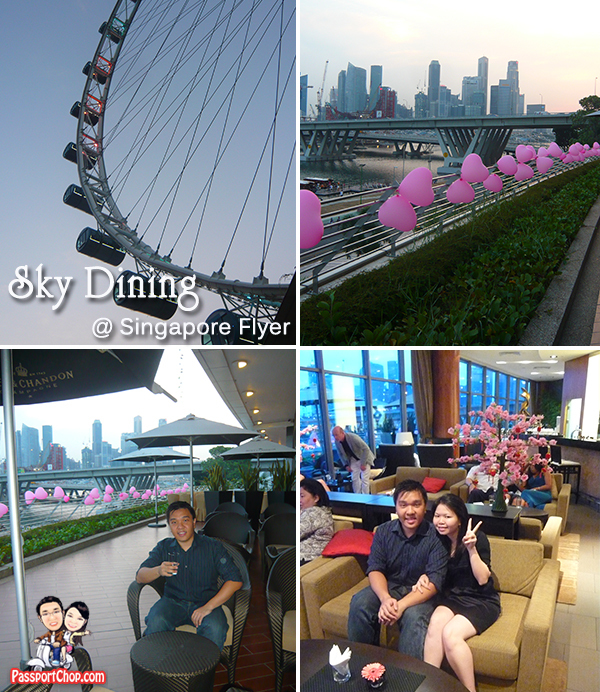 For the Singapore Flyer Sky Dining, there are even flight check-in procedures – no need to bring your passports. Just turn up 30 minutes prior to your scheduled dinner timing and check-in at the ground floor VIP lobby with your tickets. You will be ushered up to an exclusive lounge for flight guests only – here you can rest and watch the news while enjoying complimentary water from the friendly service staff. The entire Singapore Flyer Sky Dining experience takes 1 hour and involves 2 rotations of the Flyer. During the first rotation (30 minutes), we were served a welcome drink of Fresh Summer Berries in Ginger Ale and a starter dish of Pan Seared Scallops with yellow and green Zuchinni Carpaccio. This dish is topped with baby argula salad and roasted pine nuts and tossed with a lemon olive oil dressing – very yummy menu descriptions but as the Flyer cabin is so dark, we couldn’t tell the difference between each of these ingredients; definitely can’t tell the yellow and green Zuchinni. Nonetheless, it was still quite a yummy dish – to see how dark it is – check out the pictures below. Just a tip for you to take note if you intend to take pictures of your food during your Singapore Flyer Sky Dining – don’t choose the table in the inner middle section. Take either one of the corner tables in the cabin, preferably the ones facing outwards, it is relatively brighter there so good for taking pictures. However if you are looking for a more romantic dining experience and the only light you need is the artificial candle lighting – go for the inner middle table. Our main course of roasted roulade of chicken wrapped in Turkey Bacon accompanied with sweet potato mash and garlic baked zucchini topped with thyme infused gravy were served during the second rotation. As the Flyer approaches the end of the first rotation, check out the deft movements of the flight stewards in transferring the food into the cabin while the Flyer is still moving. 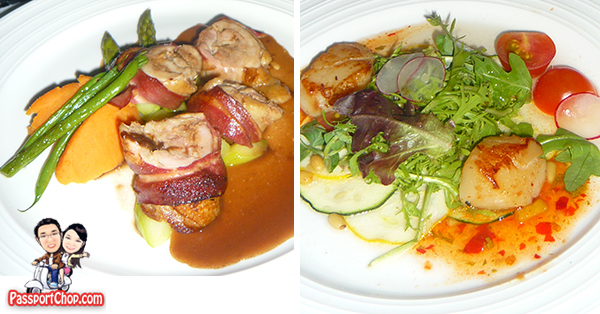 For the main course, you get 3 selections typically beef, chicken or fish and the menu changes monthly. You have to provide your preferences few days in advance so they could make the necessary preparations. 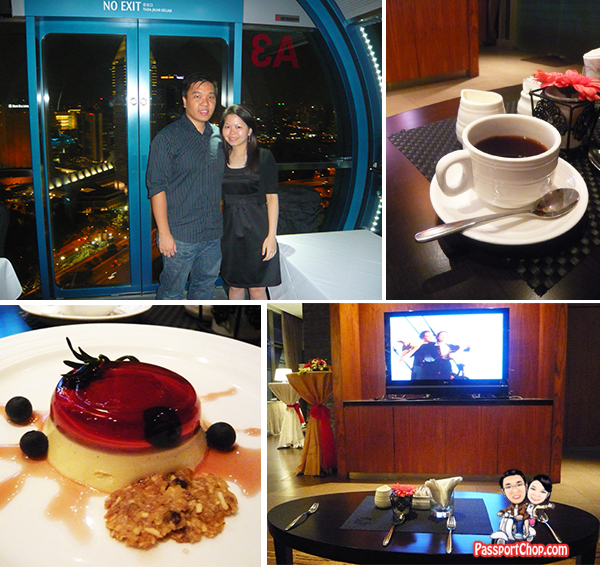 Interestingly, the highlight of the food served during Sky Dining Singapore Flyer is the dessert which is served with coffee or tea in the VIP lounge. This dessert is one of the best I have ever tried – it was Blackberry Panna Cotta – a concoction of white chocolate buttermilk panna cotta chunks of white chocolate topped with blackberry gelee and their sweet reduction lacey florentine cookies. A very long menu description for a dessert which we can summarise with one word – Yummy! A perfect ending to an unique Sky Dining experience onboard the Singapore Flyer. Great story on a great experience. I haven’t gone to Singapore but your post on the Singapore Flyer Sky Dining definitely tops my list of things to do once I’m there. hi, found your blog while searching for more info on the sky dining. as you have been to both, which is better? i am looking for a romantic, preferably with privacy outing/dinner with my partner. for the sky dining, 1 cabin only can accommodate 1 couple? for the Singapore flyer, it accommodates many people? The Cable Car definitely wins in terms of privacy since it will just be the 2 of you whereas Singapore flyer (unless u book the entire cabin at thousands of dollars), you will be dining at separate tables (for 2) with at most 4 other couples. but the problem is the Cable Car is very small and cramped compared to the Singapore Flyer where you can walk about in the cabin and enjoy the view. So up to you – privacy vs. comfort vs. price (i believe Cable Car is cheaper – you have to check with the Mt Faber group directly). The beef looks really delicious to me even when I prefer fishes. it’s a wonderful experience.May i ask u a question? I wanna hv dinner with my bf to celebrate his birthday in S’pore Flyer..
could u gv me some ur experiences?